Atif Aslam has been given a new lease on stardom with his spiritual song for Ramadan. ATIF ASLAM talks to Aamna Haider Isani of Instep Magazine about the new song and falling over at concerts. Instep: One minute it’s Coke Studio and the next you’re in a Ramadan advertisement with Dawud Wharnsby. From rock to religious anthems, how do you balance the two very different genres without shaking up a doodh soda? Atif Aslam: I am a Muslim and I feel I don’t have to wear the shalwar kameez or fold my trousers high to prove that. This is as much part of me as my pop star image. For me religion is primarily about peace and having compassion for other people. Instep: So how long will it be before we see you endorsing chips with Junaid Jamshed? AA: I don’t see things getting that intense. People have seen my pop star image and not this side of me, which is why it may strike them as odd but this is just as much part of me. It probably won’t affect my music because I feel you can be a rock star and have a religious side as well. For me the two can co-exist and I don’t see that changing any time soon. Instep: Back to rock then, how have your fans responded to the Coke Studio finale? AA: Amazingly. Coke Studio came to me very naturally, it was easy for me, and I was surprised that it brought me more appreciation whereas something with a mass following doesn’t always necessarily. Doorie and Jalpari had the mass appeal. But ‘Wasta’ got a great response. And fans found ‘Mae Ni’ different from what I have on the album. The overall response was great. Instep: Who would you give credit to for Coke Studio? AA: Oh absolutely everyone on the set, from the folk musicians to Gumby – who is a brilliant percussionist – and of course, Rohail Hyatt. Credit goes to everyone. Instep: Do you think the Coke Studio way of singing will spill into your music now? AA: Actually it was always part of it. I always synchronize different songs and beats at my concerts and this fusion is something my fans have grown accustomed to. But I have been hearing a lot of people say that the old Atif is back. I had a concert recently and people asked for ‘Meri Kahani’; it’s as if my fans are hearing my music in a new perspective now. Instep: Is there a new album in the pipeline? AA: No there isn’t. I feel I am beginning to understand the dynamics of the music industry now after five years and I want to deliver the best of what I am capable of. I don’t want to rush into it. Instep: How is business with India since things kind of froze after the Mumbai attacks? AA: Things are good. I just recorded a new song for the film Ajab Prem Ki Ghazab Kahani. All I know is that Prem is Ranbir Kapoor and Katrina Kaif is in the film too. Instep: And what else have you been doing after Coke studio? AA: I just completed a seven gig tour that started with Islamabad and travelled through Karachi, Manchester, Nottingham, and London and back to Karachi, finally completing the circle in Islamabad for Lok Virsa, all within a week. AA: Best response in London and Karachi. The London concert also had Shakhti Kapoor and Shefali. Instep: Shefali who? Baby Doll? Instep: And a memorable moment of this 7-gig tour would be? AA: You know I have this move – a backward bend that I do in all my concerts – well I fell while doing it. And at the risk of people laughing I have to confirm that I actually did fall and it was not part of the act. 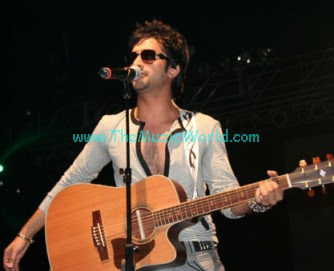 ATIF ASLAM & STRINGS... Together ?